I don't know who's responsible. Maybe it's television (I suspect the Waltons) or riveting literature from the past (perhaps Little Women), though it could simply be my nagging conscience. But whenever I think of a "family meal," certain images are conjured up in my mind. I see a father sitting at the head of the dinner table (which is covered with a tablecloth). Polite, soft-spoken children are eating everything on their plates, their napkins neatly in place over their laps. Quiet conversation ensues and everyone says "May I please be excused?" when the meal is over. This imagery certainly doesn't come from my own experience, yet it seems to be a subconscious standard by which I measure the quality of our family mealtimes. At our house it's mostly a matter of, "Your dinner is in the microwave. I've got to pick up the Cub Scouts." When we do manage to gather together around the table, the children are often seen capping their teeth and fingertips with pitted olives, flipping cream cheese with their carrot sticks, and occasionally I catch someone gargling his milk. As far as stimulating conversation goes, no one would mistake our table talk for cabernet commercial. There are, however, frequent and dramatic protests: "Oh, sick!" "What is this garbage?" "What else are we having?" That's when I answer, "Take it or leave it. Like it or lump it. Eat it or wear it!" One Saturday afternoon I happened to mention to one of the kids that I had already made Sunday's dinner. He said, "What is it?" I said, "Swiss steak." He said, "Is that the barfy looking stuff in the refrigerator?" Basically, it's safe to say that the kids regard all home cooking as inferior to McDonald's, Pizza Hut, or Kentucky Fried Chicken. Home cooking, they suppose, is what you to eat when you're too poor to go out every night. As I see it, the family meal problem is threefold. First, there's a kitchen management (organizing kitchen space in order to streamline preparation and speed up work). Second, we have a problem of food management (inventory, preparation). Last, and probably the most difficult, is the issue of kids and food (getting them to eat it as well as serving an actual meal when the family calendar looks like the flight plan at O'Hare Field). If you're busy, you need menu planning. If you don't know what you're going to fix for dinner, how will anyone know what they can do to help? With your menus planned in advance, you can dove-tail your operations, plan leftovers, delegate effectively, and work ahead of yourself. Now, let's see "dovetailing" in action. Monday: When preparing vegetables for the Swiss Steak, chop up a few extra to be used in Wednesday's gelatin salad. (Leftover peas will also be used). Also, slice extra celery for Tuesday's potato salad and Thursday's stir-fried beef. (Keep sliced vegetables in a airtight container to keep them crisp and prevent vitamin loss. Cut up the flank steak for the stir-fried beef and quickly brown it just before you brown the Swiss steak. Refrigerate until needed. Bake extra potatoes to use in Tuesday's potato salad, it's easy to toss the salad together while the ham is heating and the broccoli is steaming. Be sure to plan enough leftover ham for scalloped potatoes and ham later in the week. Wednesday: The chicken is already cooked, boned, and cut up. The vegetables are ready to add to the gelatin. All you need to do is set the salad, cook the rice (make extra for Thursday's stir-fried beef, rice cereal for breakfast, or rice pudding), steam the asparagus, and assemble the chicken and rice casserole. Thursday: With the rice, meat, and sliced celery prepared, all that's left is to assemble ingredients and quickly stir-fry beef and vegetables. Heat soup and rice. Are you beginning to see what a little planning can do? By concentrating your activities you've eliminated several "get ready" and "clean up" jobs. For example, in our sample menus, if you prepared each meal individually, you'd have to chop celery four times. By dovetailing, we did it once. You'd prepare potatoes and rice twice each; with dovetailing, we did it once. You'd brown meat twice; with dovetailing, we did it once. Those figures tell me that I can cut my work in half! I'm all for that. How about you? To get the most from your dovetailing efforts, be sure you have your meal plans written out so you can "see" exactly what needs to be done. Remember those work simplification techniques? Think before you act is the key here. Now you can drop a few more clean-up jobs from your list by working ahead of yourself. Monday night, while cleaning up dinner, mix up the potato salad. Tuesday night, set the gelatin salad. Wednesday night, mix up the corn soup. You can clean up these preparations right along with dinner dishes. Menu planning and dovetailing operations enable you to bunch your saved time into a useful portion. Plan your menus for a week, two weeks, a year, or just list several meals and have all the ingredients on hand. Every morning choose and prepare whichever meal fits your mood and your schedule. If you use a rotating schedule for your menus, set up a dovetailing system to go along with it. 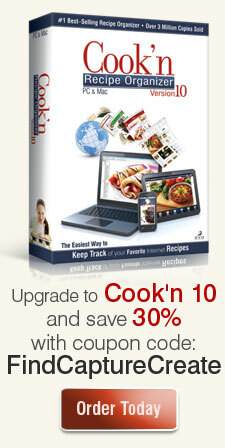 That way, you'll have everything down to a science and get your meals prepared in record time! Meals can be planned around hectic schedules, too. On busy days, crank up the crock-pot and let it simmer all day, or whip up some hot soup and sandwiches. Bake some potatoes and top them with a quick, nutritious stuffing. (Cut a hot spud in half, fill it with cheese, close it back up, wrap it in a napkin, and eat it on the run!) Cook up a batch of omelets and server fillings buffet style. Food cannot nourish if it isn't eaten. With menu planning and your calendar working together, everyone will be assured a nutritious meal even on the busiest days. Menu planning can also prevent the scourge of leftovers (you know, those things you save so you can throw them out later). You should never have leftovers unless they're planned (e.g., leftover pork roast can be used for barbecued pork). Leftovers clutter up the refrigerator, anyway. If you're frequently discarding leftovers, start planning them--or prepare smaller servings to begin with. Menu planning is a fundamental skill far too important to disregard. With your meals planned you can clearly outline what you want your recruits to do. They can start chopping the vegetables, boning the chicken, peeling the potatoes, tossing the salad. Before long your fledglings will become veteran cooks who can put together a whole meal on their own. Delegating kitchen detail is easy if you follow the right steps. The most important aspect of the routine is training. Work with the kids long enough so they feel competent. Be sure they're in the kitchen through the whole meal preparation so they learn all the aspects of the job--including where things should be put away. Without written menus you're always thinking about what to fix for dinner. And when you finally decide you'll probably have to run to the store at 5 P.M. (or stop on your way home from work) to pick up a few things. (Sound familiar?) Do you see what that does to your time? You are deciding what to fix for dinner. You are running to the store. You are bringing home the food and the responsibility of putting it together. If your menus had been planned, someone else could have done something to help. "...I really LOVE the dovetailing tips. I usually stick the weekly menu on the fridge door, and if one/both of the boys won't be here, they mark it on there and I make adjustments based on that...maybe move their favorite to another nite when they will be here, or adjust portions..."
I hope the Cook'n Software and the Cook'n Club continue to be an aid to you and everyone else.